In the presentation of phylogenetic trees, the geometric shape of the trees often seems somehow arbitrary and is more driven by aesthetics than by informative reasons. But wouldn't it make sense to give the geometry (distances and angles) specific meanings? Or is this already done (when it's done right)? 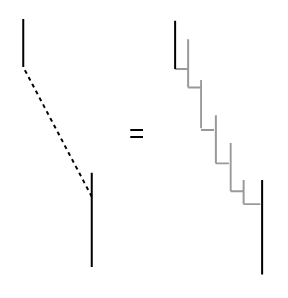 The vertical axis represents time (on a linear, logarithmic, or "anti-logarithmic" scale). The horizontal axis represents the amount of genetic change (measured in appropriate units). The line of one species (= population with virtually identical DNA) goes vertically from bottom to top. The line ends when the species becomes extinct. A new species branches off of an existing species by a horizontal line perpendicular to the line of the latter. The length of the new (horizontal) line reflects the amount of genetic change. At its end the line continues vertically. 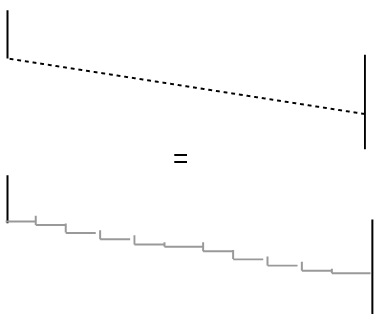 There are no other branchings along the horizontal line. b) Their have been few small genetic changes in a long period of time after branching off. 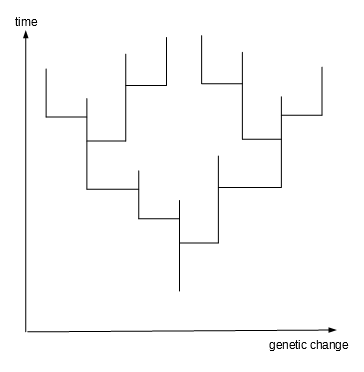 I'm looking for discussions/considerations of this kind of drawing phylogenetic trees (papers, web pages, or simply good search terms). How do you interpret ancestry in phylogenetic trees? What slowly becomes clear to me: It's about the interpretation of straight line segments, maximal straight lines, of horizontal vs. vertical lines, and nodes (= branching points) in phylogenetic trees, especially: which of them is to interpreted as a species? 1/ Temporal datasets to proportion trees: That's probably the most absent thing in species measurement. You'd need data sets of time for beetle species, for mammals, plants in millenia and million years. 90+% of that information is absent. 2/ Genetic proximity to arrange trees. Scientists publish their genome studies into the ToL project. There is lots of distance data to compare all animals.... Genetic distance doesn't graph easily because on the same tree, some distances can be 500 times longer than others. On a tree of 20 extant species, you will have branches 5mm long and 5 meters long, half the the species are on your screen and the other half are higher than the ceiling. It's best to represent them with another symbol, else interactive 3D trees where you can switch compact/large views and the tree zooms out crazily, it's illustrative and cool, else use a weighted proximity length which is 1+ similarity/50, that doesn't really work either. either way, I couldnt find a way of clearly displaying that info on the tree. Phylogeny trees don't lend themselves well to being informatively measured. You start by thinking "Oh I could find a pretty way of doing that" then when you apply the datasets, your trees become uncontrollable and jumbled up because of exponential branch lengths. I programmed phylogenetic trees based on the 81MB ToL tree of life project to represent many millions of species, to do 3D physics trees and HTTP lookups to provide wiki texts and images for all species. There is www.biostars.org a very kind and helpful bioinformatics forum for postgrads that do trees all day. There are many (dozens) of informative tree graphics programs coded by academics, to visualizw and analyzw species data, arranged into different trees and sorting through them. Not the answer you're looking for? Browse other questions tagged phylogenetics trees visualization or ask your own question. How to build S16 rRNAs phylogenetic trees? How to build a phylogenetic tree without an outgroup? Are “constraint trees” in phylogenetic analysis cheating? How can I correctly use them? How to use a published phylogenetic tree?